A little something that I made while watching some fluff TV. I hand drew the lines on the back (I like that they're crooked and not perfectly lined up) and then poked the holes with a pushpin placing the paper over a piece of cork. I used simple tape to hold down the ends of the threads on the back of the card and used another piece of white card stock to cover the back. The bluish color has 6 threads, the green and pink have 3 and the orange has 4. I wanted to see what would happen with the variations of line widths. 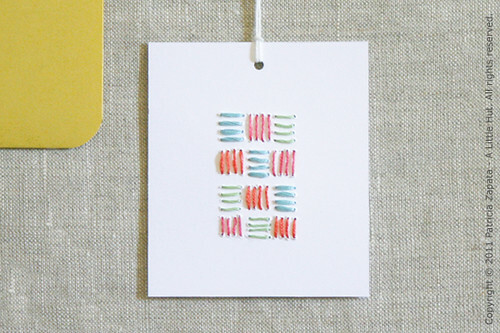 For this proportion and size of a card I prefer the lines made with 4 threads (orange). The varying thicknesses aren't too visible in this photo, but up close there is a marked difference. - Shira Ganany - A fun pop-up card/book that makes me want to give pop-ups a try. I love the simple illustrations. Thank you to those of you that shared your thoughts in yesterday's post. It's always so nice to know that we are definitely not alone. We know that. But it's always nice to confirm it.